Metro Line 2 is an important east-to-west transport link in the city. Sightseeing along the line is a lesson on what makes Shanghai Shanghai. Metro Line 2 is an important east-to-west transport link in Shanghai, connecting to the city’s two airports and its largest railway station. It traverses the Nanjing Road area, a century-old commercial zone, and the Pudong New Area, its modern counterpart. Sightseeing along the line is a lesson on what makes Shanghai Shanghai. This museum offers a potted but fascinating history of the city’s development — from humble roots to the bustling metropolis of today. It’s located in the basement of the iconic Oriental Pearl TV Tower. 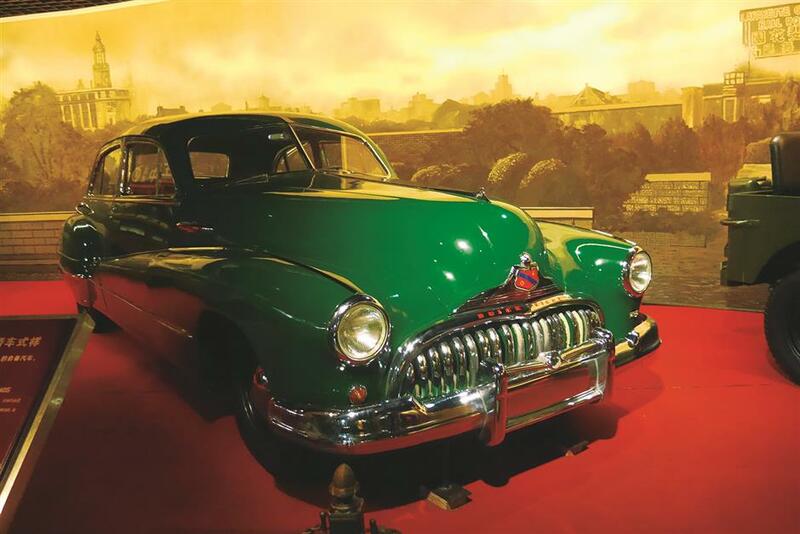 The museum does an excellent job of recreating old streets of Shanghai, complete with both life-size and scaled-down cars, trolleys and buildings. The museum mainly focuses on the era between 1860 and 1949. The entrance floor traces the evolution of transportation, from hand-pulled sedans to Shanghai manufactured cars of the 1980’s. A book about child health published in Shanghai in the late 19th century is displayed at the Municipal History Museum. Displays upstairs recreate lifestyle scenes of Shanghai residents prior to the appearance of Europeans in the city. There are several small-scale replicas of famous buildings in Shanghai that may prompt tourists to add them to their itineraries. The museum takes about an hour or so to visit. Cloud 9 bar and restaurant, located on the 87th floor of the Grand Hyatt Hotel in the Jin Mao Tower, offers breathtaking views of Shanghai. While the venue is a bit pricey, it’s a steal if you consider that the cost of a drink or snack is a fraction of the fees charged at observation decks in a nearby building. From the 87th floor you are well above the Oriental Pearl TV Tower and can see the entire Pudong New Area. If you are there on a clear day, you can scan the entire city. First-time visitors to the city usually have Nanjing Road Pedestrian Street on their recommended itineraries. Yes, the shopping is great, but beyond the glut of luxury brands, the area also offers some of the most beautiful old architecture of Shanghai. Although some vintage buildings are not open to the public, a walkabout takes you back in time. Holy Trinity Cathedral is one example. 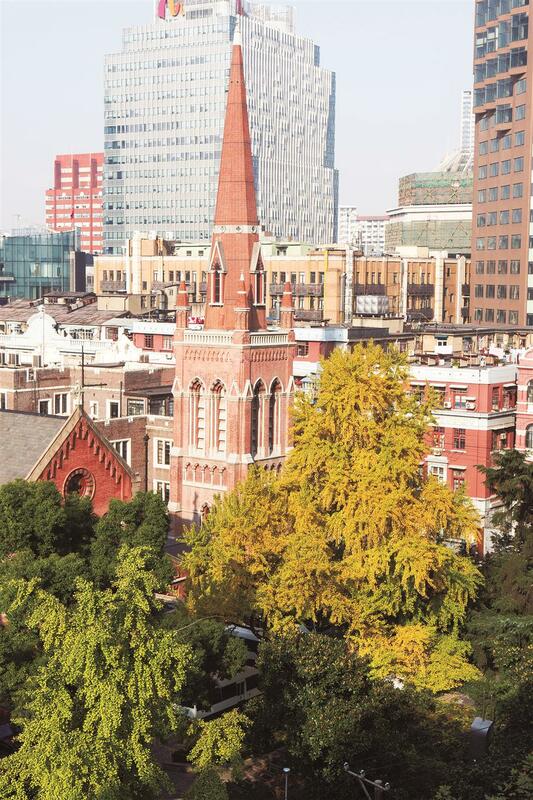 The oldest Protestant church in Shanghai is usually referred to as the “Red Church” because its façade is all in red brick. First built in 1869, the Gothic Revival structure claimed the city’s first church pipe organ. Though the church is no longer open to the public — not even on Sundays — visitors enjoy snapping photos of its beautiful façade, especially at sunset, when the structure seems to glow in the fading daylight. Another venue worth a visit is the Building of the Shanghai Municipal Council. Built between 1914 and 1922, the structure’s façade reflects different Western architectural styles. It served as the seat of city government in several historical eras. Today, it houses a few municipal agencies, including the Shanghai Civil Affairs Bureau. Address: 215 Jiangxi Rd M.
Nanjing Road Pedestrian Mall is always packed with visitors, and restaurants there are often targeted at tourists, offering traditional Shanghai snacks and classic local cuisine that sometimes fall short of authentic tastiness. But that doesn’t mean there are no good dining options. Among all the time-honored dining brands, Real Laodafang and Taikang Foods often have people lining up outside for their newly baked meat mooncakes. Although mooncakes are a traditional Mid-Autumn Festival food, their popularity knows no seasonal boundaries. And yes, the mooncakes from these two shops are considered among the best in the city. Address: 536 Nanjing Rd E.
Address: 766 Nanjing Rd E.
The temple, which has a history of more than 1,700 years, stands like a shining golden beacon in a concrete forest on Nanjing Road W.
As a Vajrayana school Buddhist temple on the Chinese mainland, constructions in the temple are symmetrically distributed. Although most of the buildings in the temple complex were rebuilt during late Qing Dynasty (1644-1911), stories passed down for centuries are still widely told among locals. One of them concerns a well that has been at the temple for more than a millennium. The origin of the well, whose formal name is Feiquan, is unknown, but historical records say that hot spring water has gushed from it from time to time. Many scholars and writers wrote poems about the spring. The original well was filled in during 1960s, and a new one was dug under the bell tower of the temple in 2003. Across Nanjing Road W. from the temple is Jing’an Park. Originally a cemetery, especially for foreigners in late 19th century, the park is now one of the most popular greenery areas of Shanghai. In the park, the ancient “Top 8 Jing’an Sceneries,” most of which have disappeared, have been replicated to show visitors the history of the area. The sceneries are actually eight pieces of ancient relics, including a pulpit, a stone stele and a fort. 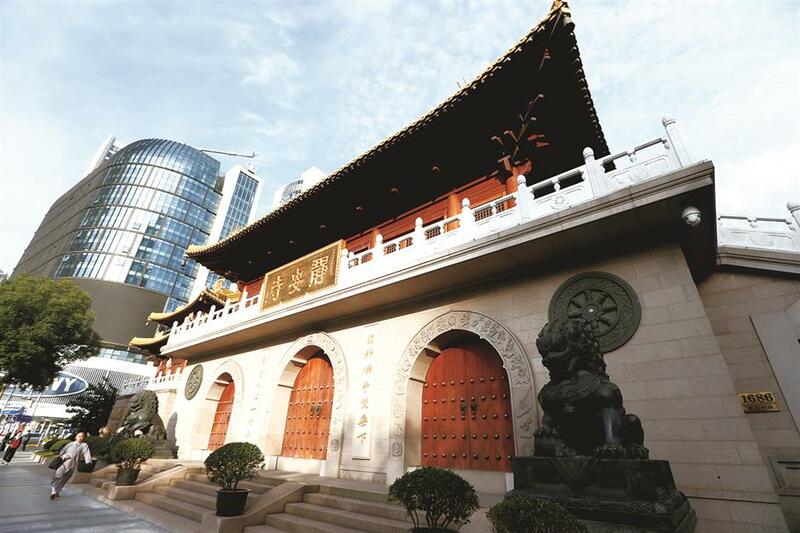 Originally the relics were all in Jing’an Temple but were either lost in war or damaged by natural disasters. The noodle house in Jing’an Temple gets good reviews. Pilgrims typically go to the temple to pray and worship Buddha in the morning, then enjoy a bowl of vegan noodles afterward. The restaurant provides only two soup options: traditional noodle soup and a tomato noodle soup. The traditional one is especially popular because its various mushrooms add a special flavor to the soup and noodles. The tomato one, on the other hand, gets mixed reviews. Some people say it tastes even better than the traditional one, but others don’t like the Chinese yam it contains. Address: 1686 Nanjing Rd W.
Zhongshan Park is a great place to take a break. Built in 1914 and originally named Jessfield Park, it was renamed in 1941 to honor Sun Yat-sen, founding father of modern China. This lovely 21-hectare park combines Western-style landscapes with Chinese gardens and is a favorite among both locals and tourists alike. The park has more than 30,000 trees of 260 different species. Its other attractions include the White Marble Pavilion, the south gate, a lake filled with mandarin ducks, and the great stone bridge. It’s a great place to see Shanghai in motion. The park is often filled with people singing and dancing, and children playing. The sleek White Marble Pavilion, located north of the Great Lawn, was moved to its current location in 1935. It’s an ideal spot to take a break and rest in a peaceful setting. The square pavilion stands about 18 meters tall. 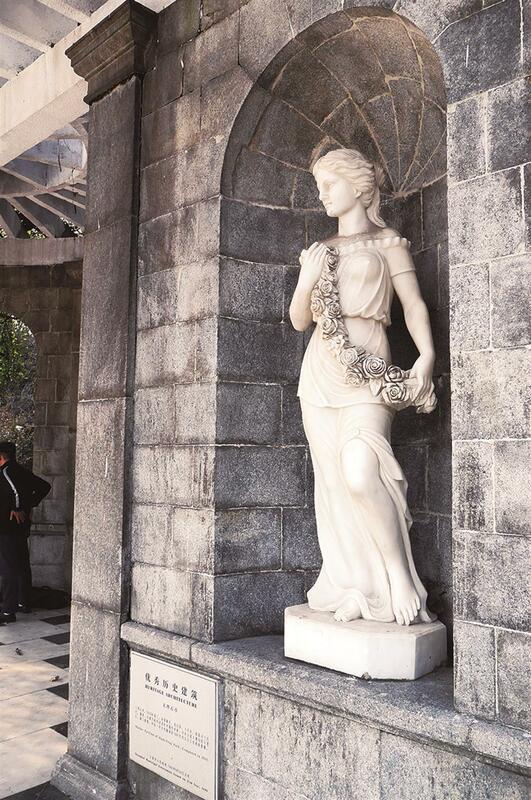 With its white pillars, stone steps and marble statues, the pavilion is a key attraction in the park. Of the six lawn areas inside the park, the Great Lawn is the largest at over 8,000 square meters. It is a great place to have a picnic, fly a kite or simply watch the clouds waft by. There is always something happening on the lawn, with people singing or playing frisbee. The park itself is a beautiful oasis in the hurly-burly of the city. An excellent time to visit the park is cherry blossom season, though flowers adorn the park nearly all year around. Sweet osmanthus and Chinese roses fill the air with fragrance. If getting back to nature stirs hunger pangs, Wingtopia is a great spot that serves up classic fried chicken wings sure to please even the pickiest of eaters. Wingtopia is located just across the street from the southeast corner of the park and is easy to find. The place boasts a simple menu of, you guessed it, fried chicken. All dishes are reasonably priced, and the eatery has plenty of seating for larger groups.